A bathroom vanity is the piece with the most impact in your bathroom. We recommend that you start your remodeling process with your vanity in mind and then work your way through the others areas. Make sure your flooring pairs up well with your bathroom cabinet as they will be the focal point for anybody that walks into the room. The right stain of wood is also crucial as it will determine the color of your walls and how well they will make your bathroom vanity stand out. Choose the right size of bathroom cabinet that complies with the plumbing code of your area. Please remember not to get too close to the toilet (if that is your case) as it will make the bathroom look crowded and uncomfortable. Align your vanity as best fits your bathroom design. You can either center it along the wall or push it against the corner. Make sure you get a bathroom vanity that has the sufficient amount of storage for the particular bathroom you are remodeling. Check that the drawers and cabinets have enough space to store medium and large items (such as combs and hair dryer). For small items, consider getting a cabinet mirror instead of a flat mirror on top of your vanity. A modern free standing vanity can have an spectacular and dramatic look when combined with the right wall style. 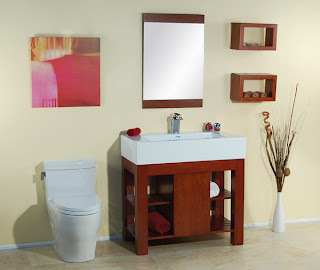 All of our modern bathroom vanities are finished with the same high quality stain in all sides. Most of the bathroom cabinets are made out of solid wood and the hardware used is guaranteed for life. Lastly, remember that the most successful bathroom remodeling is the one that is designed around your personal needs. The grey linen in addition to the step up to the tub (if you decide to go with it) would look very cool. Very oriental style, I say go for it. Best of luck! !